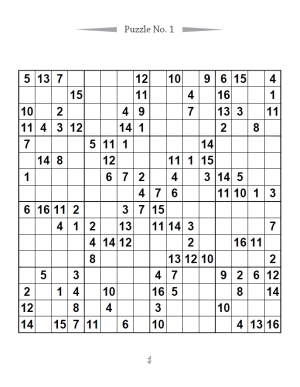 Welcome to this fantastic collection of 100 sudoku puzzles, in a large 16x16 grid size. 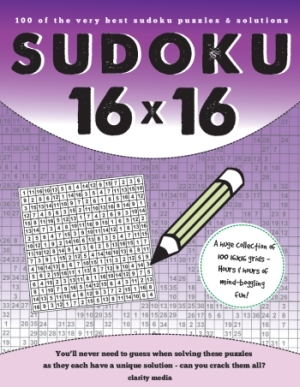 If you're a fan of traditional 9x9 sudoku but need an extra challenge then this is the book for you. Packed with full page sized puzzles, this collection of sudoku is sure to give you hours of fun. Printed on a large 8.5x11inch page size, these puzzles are much easier on the eye and enjoyable to solve with plenty of room for markings along the way. Every puzzle has an attractive symmetrical design and will gradually get harder in difficulty as you work through the book. The instructions are simple: place each number from 1 � 16 exactly once in each row, column and bold-lined 4x4 box. You'll never need to guess when solving these puzzles as they each have a unique solution. Can you solve them all? Full solutions are listed towards the back of the book so if you get stuck - take a peek there! Good luck & happy solving.